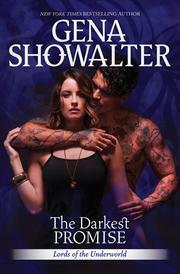 New York Times bestselling author Gena Showalter returns with a sizzling Lords of the Underworld story about an iron-willed sovereign and the somber beauty who melts him with a glance. Lazarus the Cruel and Unusual rules his kingdom with a single unwavering focus: to build his army and annihilate his enemies. Nothing distracts him until Cameo. He is relentless in his quest to make her smile and seduce her into his bed. The Lords of the Underworld are back, and I’m already waiting for more! Finally! Finally we have been blessed with Cameo’s book. I’ve been waiting on the Mother of Misery’s story since I finished the first three LOTU books years and years ago. I always knew her man would be amazing, and yes, Lazarus lives up to that title. Let’s talk about the characters of The Darkest Promise first. Cameo is a great character. I love how she doesn’t back down and she’s bada$$, even with a macho man by her side. Her character/demon development also really fit well into the plot points of the story, despite not being mentioned in previous books. Lazarus, Cameo’s macho man, was very nice as well. *wink, wink* He’s a very unique paranormal creature, and I’m still not sure exactly what all he can do powers-wise. What I wasn’t so sure about for this book at first though, was the two characters’ relationship. It seemed like they went from having an awesome tension to having some weird high school crush. In one of the previous LOTU books, they bickered at each other, but in this one, it was just some awkward narcissistic banter. HOWEVER, while I did miss that tension, I did grow to enjoy Cameo’s and Lazarus’s interactions fairly quickly. That’s probably my only major qualm with this book and books 4-12 in this series. The other stuff’s just minor things I noticed. Because, really, there was a lot of action, the plot moved along really well, there was an abrupt ending that left me wanting more, a lot of twists and turns in the middle of the book (the ending was a tad predictable, but every romance story requires a HEA, right? ), and the book even has an awesome timeline at the end to refresh readers! Oh, and all of the Lords are seen or mentioned in the book, and they’re all together! Yay! I can’t remember the last time they were all in the same area at the same time. If you are in any way a fan of Kresley Cole or J.R. Ward’s books, you’ll love Showalter’s Lords of the Underworld series. If you can’t decide whether or not to pick this one up, do it! You won’t regret finally knowing where Cameo’s story takes her. Also, some pretty major plot points for the entire series happen in this book. Just FYI. Side note: I am a little disappointed by the title. Usually, the titles play into one of the narrator’s demons, but that really wasn’t the case for this book. Plus, there are a lot of The Darkest P books in this series (i.e., The Darkest Prison, The Darkest Passion, The Darkest Pleasure). Love the cover, though! *Note: I won an ARC copy of this book from the author. This in no way affected my opinion/review. I still haven't read Gena Showalter. This is a series that I know I really need to pick up. It sounds exactly like my kind of book so it is probably a pretty safe bet. Glad you enjoyed it. Thanks, and you should definitely try Gena's books!